This summer I participated in the second annual Studio A Workshop sponsored by the Avonworth School District. The workshop combines Design Thinking and Project-based Learning with a focus on Arts Integration. Educators came from over twenty school districts and a host of other organizations. I’ll use my new insights to develop the structure for four Design Challenges I’ll coordinate during the 2017-2018 school year for the Energy Innovation Center. The program will include high school students from the Parkway West consortium of schools. In June I worked with a team of educators from the South Fayette School District to produce the 4th annual STEAM Innovation Summer Institute. 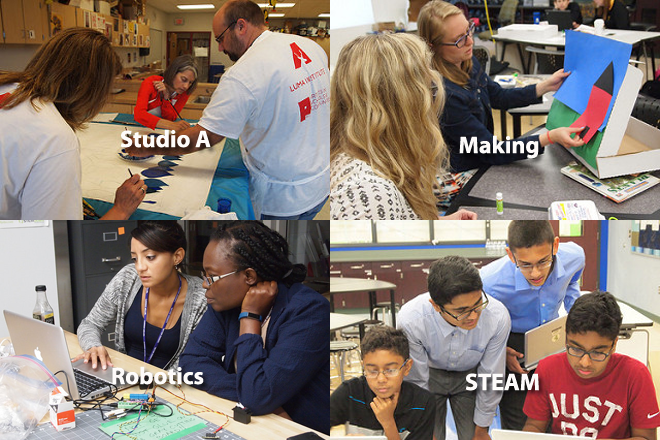 Educators came from around the region to sample 15 different workshops that included Python (led by a high school student team), Making, Hummingbird Robotics, and Scratch. In July I authored the section on “Redesigning Learning Spaces” for the 2017 K-12 Horizon Report that will be released in August. Also in July I worked with the Birdbrain Technologies team to produce the first Interdisciplinary Robotics & Computational Thinking Conference in Pittsburgh. This year over 60 educators from the GEMS Schools in Dubai came to Pittsburgh for training led by the CREATE Lab at Carnegie Mellon University and Birdbrain Technologies. The GEMS educators focused on the use of the Hummingbird and Finch robots for multidisciplinary projects in grades K-12. As an outcome from the Osher class I taught this spring at Carnegie Mellon University focusing on the Remake Learning movement in Pittsburgh, a group of interested folks met in June at the Squirrel Hill Library to look at how senior adults can become an active part of the Remake Learning Network. The 2017 Three Rivers Educational Technology Conference (TRETC) will take place on November 6-7 at the Montour School District. I’ll have a chance to be a featured speaker and share some of my work on “Redesigning Learning Spaces” in the new K-4 building at Montour.